Nice. Did it cost you $600? A friend was trying to buy one and the web site was timing out. $580 after tax and FREE OVERNIGHT FEDEX because I don't use TMO, and don't want to wait [REDACTED] months until the AT&T 3G radio compatible model is out (I use wifi on it anyways to get the best internet access speeds). Ideally any phone that can run the Android 2.x and has WiFi will be able to autoconfig IPv6. I wonder if it can do teredo or 6to4 via its phone network? I think I got teredo going through sprint's network using PDANet on my laptop. I 'spose it also may be possible to set up a 6in4 tunnel. Also I guess you can now start playing with mobile IPv6? I haven't really read much about it, but looked interesting. I guess the network would have to support it unless it could work though a tunnel. The iPhone doesn't in general because the high level libs they have eat IPV6 addresses ... but you can use C instead of Cocoa and at least one App does. 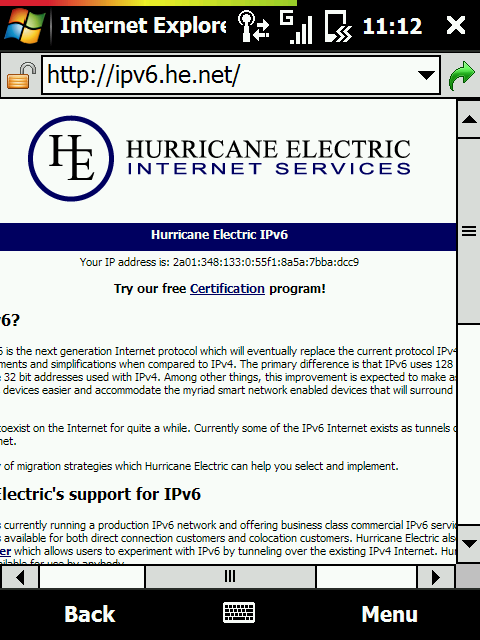 IPv6 Query .. just does DNS lookup and tutorial stuff ( how to read an ipv6 address etc ). I have a Nokia e71x that partially supports IPv6. There is an option to manually set an IPv6 DNS server, but no option to set the actual IPv6 address. I'm assuming this functionality will be implemented in the future, but haven't been able to find anything online regarding it. T-Mobile has v6 on their mobile network in testing and supposedly should have something publicly later in the year. Why don't you have 3G? Anything else is too painful and not worth using. NexusOne isn't compatible with AT&T's 3G freqs, until Google releases the version of the phone that is. EDGE works plenty fine for my needs, or wifi if I really need fast internet on a phone. Oh ya, I forgot about that aspect. But I know what you mean since I have an N900. EDGE does NOT work plenty fine for my needs, it is way too slow. Unless it was hiding in the slides at the 4.0 presentation.